PepsiCo, Inc. (PEP) manufactures, markets, and sells various foods, snacks, and carbonated and non-carbonated beverages worldwide. The company operates in four divisions: PepsiCo Americas Foods (PAF), PepsiCo Americas Beverages (PAB), PepsiCo Europe, and PepsiCo Asia, Middle East and Africa (AMEA). The company is a dividend aristocrat which has increased distributions for 38 years in a row. The most recent dividend increase was in May 2011, when the Board of Directors approved a 7.30% increase in the quarterly dividend to 51.50 cents/share. PepsiCo’s largest competitors include Coca Cola (KO) and Dr Pepper Snapple Group (DPS). Over the past decade this dividend growth stock has delivered an annualized total return of 5.50% to its loyal shareholders. The company has managed to deliver an average increase in EPS of 12.10% per year since 2001. Analysts expect PepsiCo to earn $4.41 per share in 2011 and $4.65 per share in 2012. 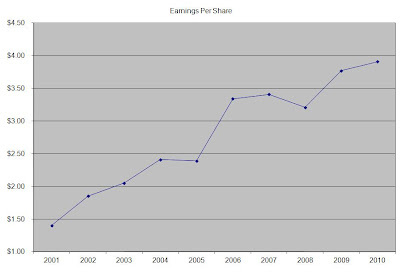 This would be a nice increase from the $3.91/share the company earned in 2010. Over the past decade, PepsiCo has consistently managed to repurchase 1% of its outstanding shares every year, on average. PepsiCo has recognized that carbonated drink sales are not going to grow significantly in the future, which is why it has focused on fast growing non-carbonated soft drinks. The company’s innovation in the area has been successful with the introduction of Aquafina , Gatorade and Propel, Lipton teas and Tropicana. Pepsi has also started to emphasize on health and wellness, and has worked to minimize the amount of trans fats in its snack foods. Future earnings growth could also come from synergies associated with the acquisitions of its bottlers, streamlining of operations and cost cutting. The distribution networks of the bottlers acquired could be used to push some of PepsiCo’s non-beverage products such as snacks and other foods. Earnings growth could also come from strategic acquisitions, as well as product innovations in health and wellness food and beverage section. In 2011, PepsiCo acquired the leading Russian food and beverage company Wimm-Bill-Dann (WBD), in an effort to position itself in the growing emerging market in Russia and to build its nutrition business. 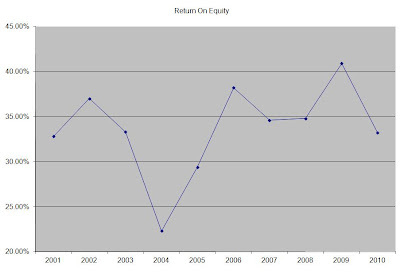 The company has a high return on equity, which has remained above 30%, with the exception of a brief decrease in 2005. Rather than focus on absolute values for this indicator, I generally want to see at least a stable return on equity over time. The annual dividend payment has increased by 14% per year since 2001. A 14% growth in distributions translates into the dividend payment doubling every five years. If we look at historical data, going as far back as 1978, we see that PepsiCo has actually managed to double its dividend every six and a half years on average. Over the past decade the dividend payout ratio has remained above 50% briefly in 2008. A lower payout is always a plus, since it leaves room for consistent dividend growth minimizing the impact of short-term fluctuations in earnings. Currently, PepsiCo is attractively valued at 15.70 times earnings, yields 3.30% and has a sustainable dividend payout. In comparison Coca Cola (KO) yields 3% and trades at a P/E of 19. I find PepsiCo to be a better value than Coca Cola in the current environment. Investors who subtract the one-time accounting gains from Coke's EPS would find Coca Cola overvalued relative to PepsiCo. As a result, I would give major preference to PepsiCo shares over Coca Cola.